I feel like every article I read on exercising for fertility focuses on using exercise to drop pounds to reach a healthy weight. How to fit exercise into your routine and enjoy it. This advice is accurate and useful, but only addresses some women’s situation. Most advice out there assumes you need to lose weight to get your body ready for a baby, but that’s not always the case. Just like anything in life, you can have too much of a good thing. Too much exercise can negatively impact your chances of conception as well, and too little body weight – specifically body fat – are associated with reduced fertility. In reality, there is a range of ideal BMI and body fat percentage for conception, and it may surprise you! As with anything regarding personal health, exercise and a healthy weight are highly individual. Some women can run for an hour multiple times a week without affecting their hormones, while others may throw off their periods with a few 4 mile jaunts. 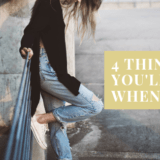 Still, these numbers and concepts apply to all, finding your personal balance and range may take some tweaking, but these numbers are a great starting point to assess where you stand. First let’s look at the optimal BMI and body fat ranges, then we’ll get into the exercise component. Body weight, and especially body fat, play a crucial role in our reproductive health. 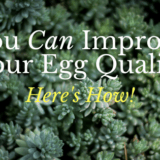 Having too low body fat can result in amenorrhea – lack of a menstrual cycle – since it affects estrogen production. You may think you’d know if you were at too low a weight, but what appears to look healthy, may not be what your body needs for hormone balance. General guidelines state a healthy BMI (Body Mass Index) for a grown woman is 18.5-25 which, for a woman of 5’5″, is a big range of 112-150 pounds. However, the ideal preconception BMI seems to fall between 20-24, meaning a little more weight is optimal for fertility. Perhaps you feel totally fine with a BMI of 19, but your body is best primed to get pregnant at the 21 mark. Again, this is completely individual, but something to keep in mind. My issue was low body fat (coupled with endurance running). When I took the progesterone challenge twice with no success, I went to see an endocrinologist who determined my estrogen was too low to maintain any uterine lining (what would shed to give me a period). His suggestion was to eat more healthy fats and cut down on any intense exercise (we’ll get to that later). Studies have shown that women with low body fat (under 22%) have lower levels of estrogen, creating ovulatory dysfunction. In fact, being underweight is cause for 12% of infertility cases. 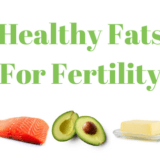 In general, women need a minimum of 18% body fat to conceive, but should keep in mind that over 31% body fat can also cause issues with fertility. Body fat is harder to determine than BMI, however using a scale like this, or caliper method with calipers like this, will give you a ballpark of where you fall. I always tell my clients that stress is stress is stress. Stress has numerous health risks, and when we think of life stressors, we mainly think of work and home/life stress, seeing exercise as a stress reliever. It’s true, exercise can be a great stress reliever for the mind, but it’s still a stress on the body, especially intense exercise like bootcamp classes or endurance running. Research has shown that extreme exercise can negatively effect the thyroid which can impact your hormonal balance and reproductive system. In a Norwegian study, researchers found that both very high and very low levels of physical activity negatively effected a woman’s fertility (source). So, what is the right amount of exercise? While there are no exact guidelines on how much is too much – again, this is highly individual – a good rule of thumb is 30 minutes a day of moderate exercise, or an hour 3 days a week. Enough to get the benefits of the stress relieving endorphins, and positive physical effects of exercise (strengthen your bones, lower blood pressure and glucose, reduce risk of chronic disease, boost brain health, etc.) Source. Also remember, a huge red flag for exercising too much is loss of a menstrual cycle, so be aware of any changes in your cycle with regards to exercise. Personally, I love a tough workout. Pre-pregnancy I was endurance running regularly doing 1.5 hour runs on the weekends, and completing my 7th marathon jut before going off the pill. I loved bootcamp classes and challenging myself, it was a stress reliever, but also took a lot of my time. Learning that I had to cut back in order to give myself the best chances of having a baby, was tough, but a no brainer. Suddenly stopping all workouts wouldn’t have been healthy for me mentally, and it’s still recommended to get some type of exercise in, so I reevaluated what my body needed and made some major changes that I have stuck to ever since. I kept my strength training but majorly cut back on running to around 30 minutes 3 days a week (eventually cutting it out completely once we were doing IVF), and added more walking and yoga. It’s not that you can’t do high intensity workouts, but make them the exception, not the rule. 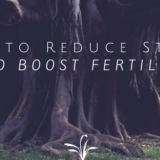 Lower impact restorative movement is the way to go to boost fertility as it is less draining on your body and hormones (resources to make a baby) and will serve as a way to manage stress. 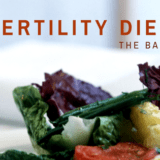 I got to have a conversation on all of this with Sarah Clark of Fab Fertile on her info packed Podcast, Get Pregnant Naturally. 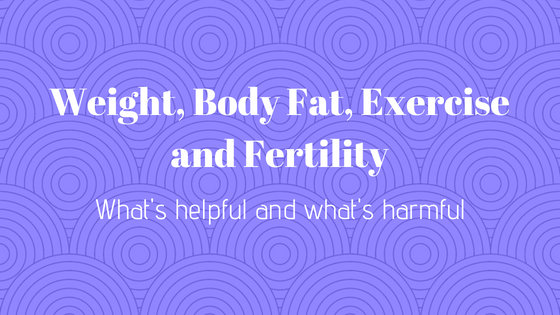 We talk all things exercise and fertility, including how much and what types are best for fertility, have a listen here!